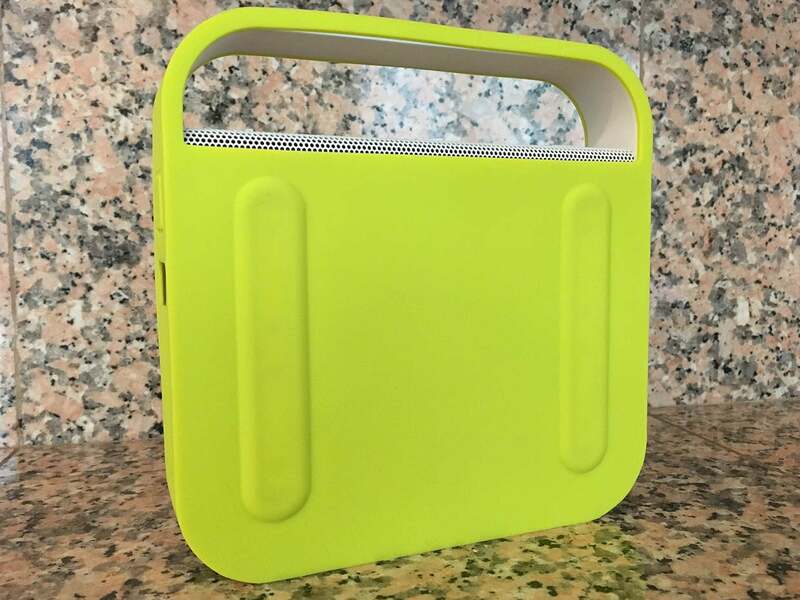 I’ve been living with Invoxia’s Triby kitchen gadget ($199 MSRP, available at Amazon) since December 2015. Essentially a niche-market Bluetooth speaker with some kiddie appeal, I just didn’t find it to be all that compelling. But now that it’s become the first third-party device to include Amazon’s Alexa digital voice assistant, it’s gone from dust-collector to prima donna status. I’m not exaggerating. My early impression of the Triby was that it was a modern interpretation of the transistor radio that graced many kitchen countertops in the last century. Maybe it was the look? Maybe it was because the Tirby’s features assume you’re placing it in your home’s central thoroughfare? Whatever the case, the Triby is a far cry from that tinny, mono-speaker experience. 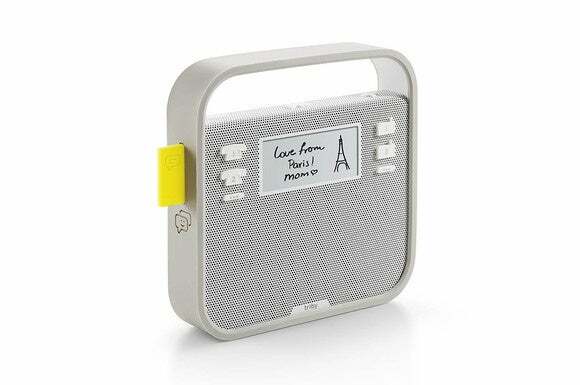 The Triby is a modern spin on the kitchen radio. The Triby has two custom-made 35mm transducers that sit on either side of a 63x52mm passive radiator used for bass amplification. There’s a four-microphone array and a Bluetooth radio onboard too, enabling the Triby to respond to voice commands and perform as a VoIP speakerphone. Invoxia says that the Triby’s mics eliminate background noise, enabling it to pick up your voice from as far as 15 feet, and my experience confirms that claim. The Triby outperformed any other speakerphone I’ve had in my kitchen. Its speaker function was smooth and clean: People on the other end of a Triby VoIP call could hear me clearly, and their voices consistently sounded intelligible. And when it came to voice commands, a 12- to 15-foot distance (15 feet was pushing it) was doable so long as I was willing to speak loudly. The Triby features what Invoxia calls In Vivo Acoustic technology. Vivo Acoustic, in a nutshell, is the combination of a driver array and 3D algorithms that address a loudspeaker’s directivity—the manner in which it radiates sound into a room. As I was playing music or talking to people with VoIP calls, I detected little distortion or coloration even when listening nearly 90 degrees off axis. Connecting the Triby to my Wi-Fi network or via Bluetooth was simple and pain-free. This isn’t a high-end speaker by any stretch. It has a good timbre, but with something of a lower-midrange bump to deliver the sensation of deep bass—a trick that tends to add a bit of bloat. The top end, unsurprisingly, isn’t crisp. Nevertheless, the rest of the audible range is satisfactory, albeit with a hint of boxiness. Alexa! So nice to see you! If you’re committed to Siri, watch out! She might become a bit jealous of your new flame, Alexa. If you already own a Triby,activating Alexa is easy. Make sure you have current versions of the firmware, the Triby App, and the Amazon Alexa app; execute a few steps, and Bingo! Alexa will come to life on your device. 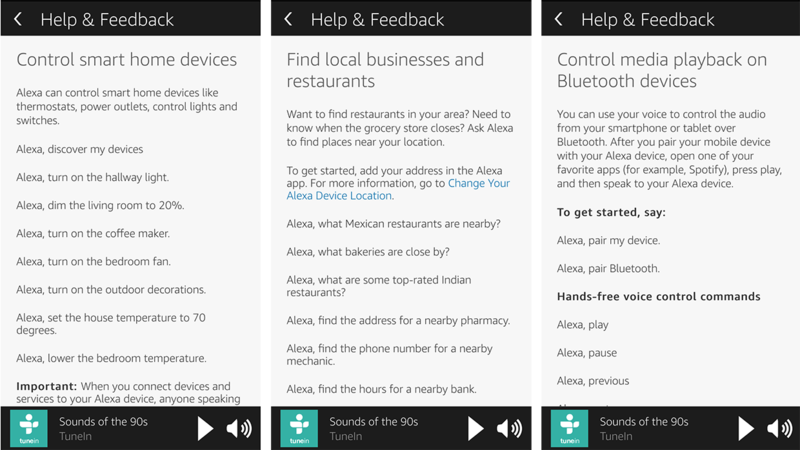 You can customize Alexa on the Triby via the Alexa smartphone app. The next steps are to enter a few preferences in the app, such as your zip code, preferred news sources, and even your favorite destination. Now you can ask for a roundup of today’s news, the weather, or even if there’s any traffic on your way to work. This isn’t some handicapped version of Alexa, either. 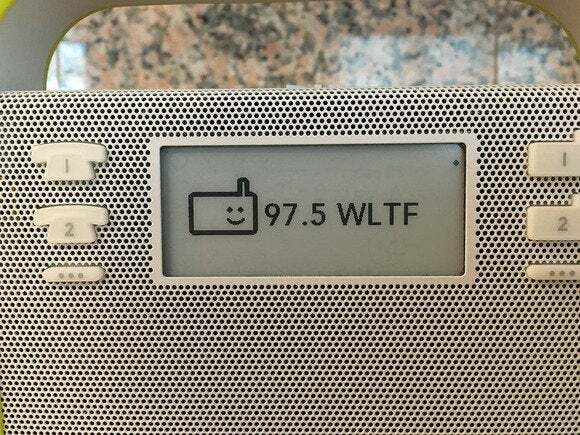 Being able to say, “Hey Alexa, play Adele,” “Alexa, play some music from Amazon Prime” or “Alexa, play NPR” without needing to press a button or reach for a smartphone was such a liberating feeling. It was so natural, so useful. I went days on end using the Triby without once picking up or needing to use a mobile device. 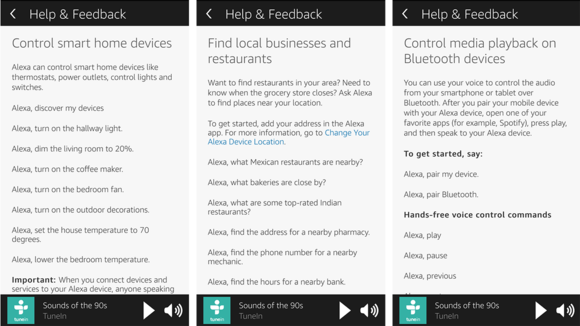 Alexa has instant voice commands for tedious tasks. After linking my Google calendar. 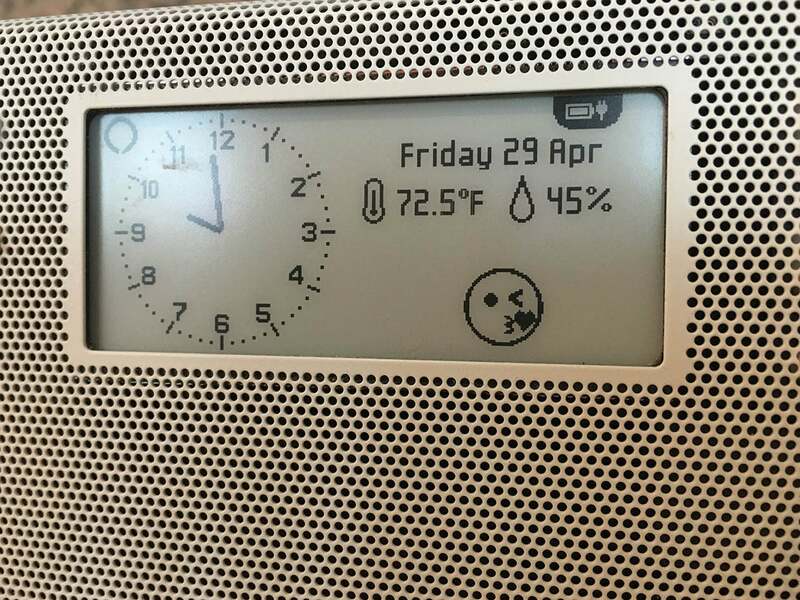 I could say “Alexa, what’s on my calendar for Wednesday?” I could control my connected-home devices—including my Nest thermostat and Philips Hue lighting. I could have even called for an an Uber ride or add stuff to my shopping list. If you’re an Amazon Prime subscriber, you get even more integrated features. Yes, Alexa’s a very smart digital assistant; paired with Triby’s excellent audio hardware, the combo is flat-out great. You might also want to read our hands-on review of the original Amazon Echo. 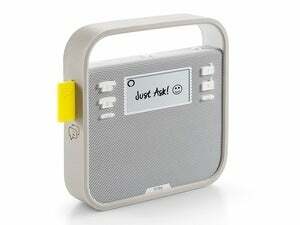 I did notice a few minor bugs and feature limitations that Invoxia should address. 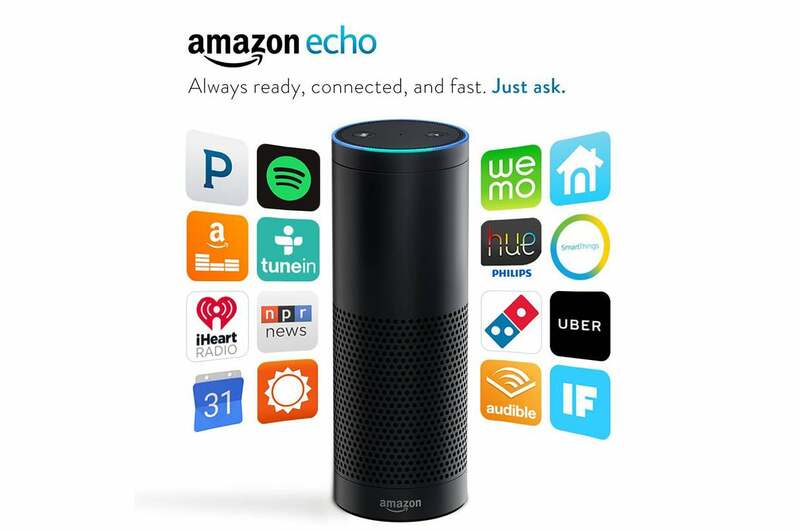 If I was playing a radio station, for example, Alexa wouldn’t respond. 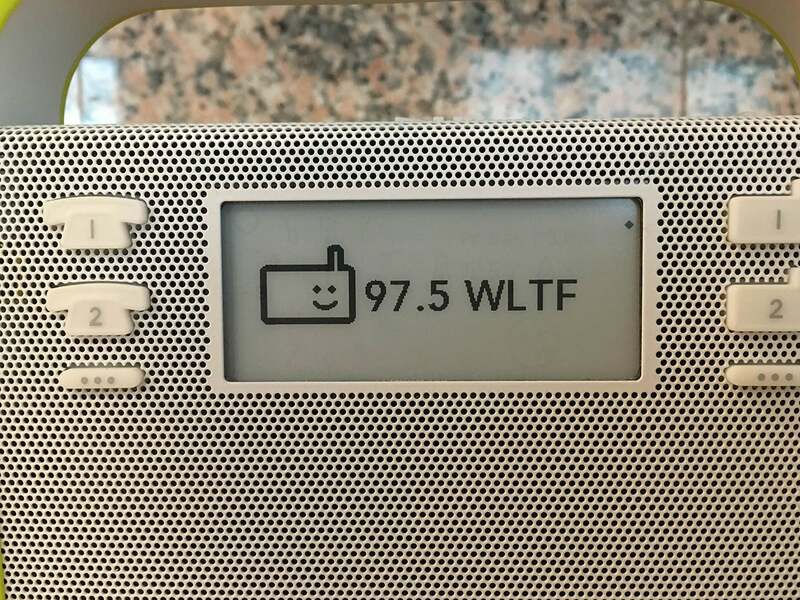 I had to stop playing the station in order for Alexa to start working again. You could argue that the Triby is really just a slightly more-expensive incarnation of Amazon’s own $180 Echo (available at Amazon). For me, the differentiation isn’t in the brains, it’s in the brawn. The Triby’s audio quality, portability, magnetic back, and more rugged design set it apart from the Echo, but the Triby’s app-specific features are less compelling. Whether the Triby is worth the few extra dollars depends on your personal preferences and priorities. The Triby and Amazon Echo have some similar features, but very different hardware. A pair of strong magnets on the Triby’s rear panel enables you to hang it from most metal surfaces, but it won’t stick to the stainless steel cladding the doors of many high-end refrigerators. 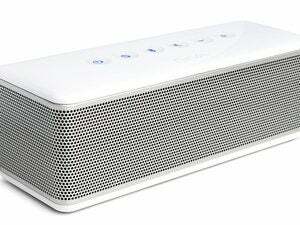 A soft silicone sleeve wraps around the speaker so that it won’t mar the surfaces it comes in contact with. 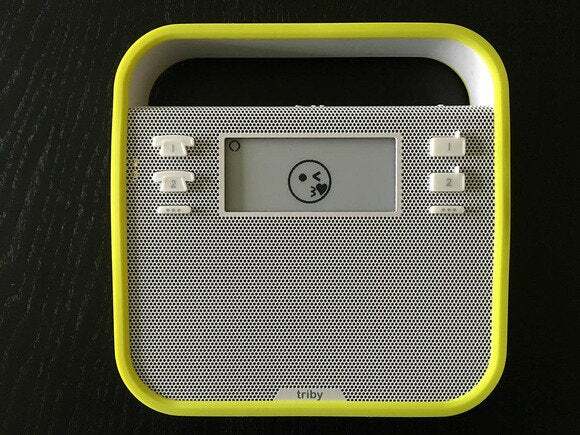 These are available in various colors: Invoxia sent the Triby in a green sleeve, but included a blue one in the box. A basket handle on top makes the battery-powered device easy to tote into another room. The Triby has two powerful popsicle-stick-shaped magnets on its rear panel. The Triby supports both Wi-Fi and Bluetooth, giving you lots of connectivity options. Just pick your app of choice and let it stream! 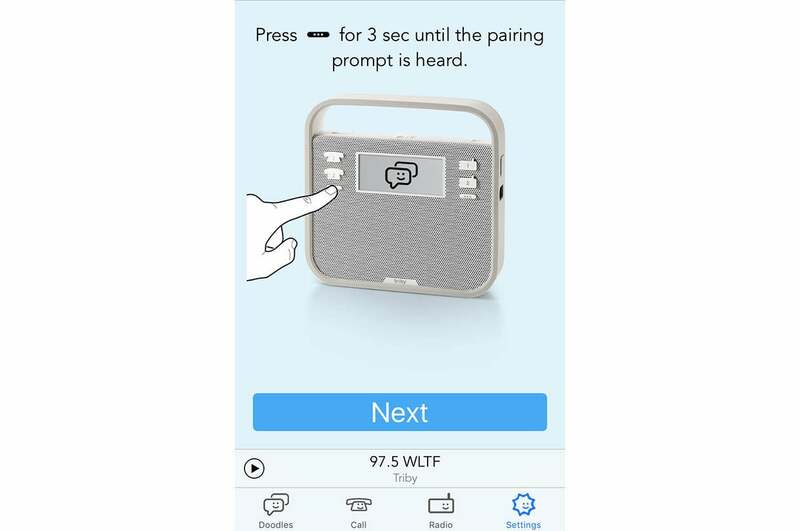 I found it easy to pair and connect the Triby with my smartphone and Wi-Fi router. The Triby has integrated Spotify Connect support. 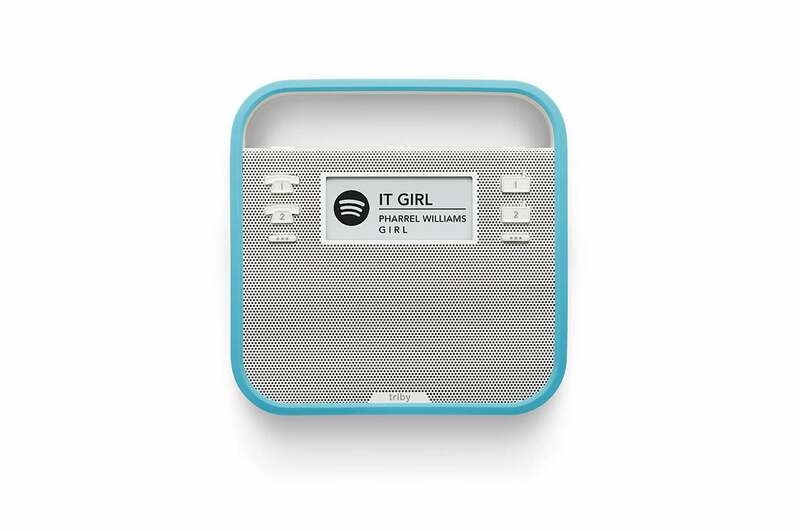 You can stream music stored on your Wi-Fi network, and the Triby also supports Spotify Connect. This enables you to play Spotify music directly on the Triby without the need to pull out your smartphone or tablet or sit in front of your computer. You can even preset any number of Internet radio stations, or program its buttons with your musical preferences. A companion app works alongside its physical buttons. While the top buttons are a play/pause toggle and volume up and down, the front of the Triby’s facade sport set of uniquely shaped buttons that hearken to the Triby’s original intent as a kid-friendly product. 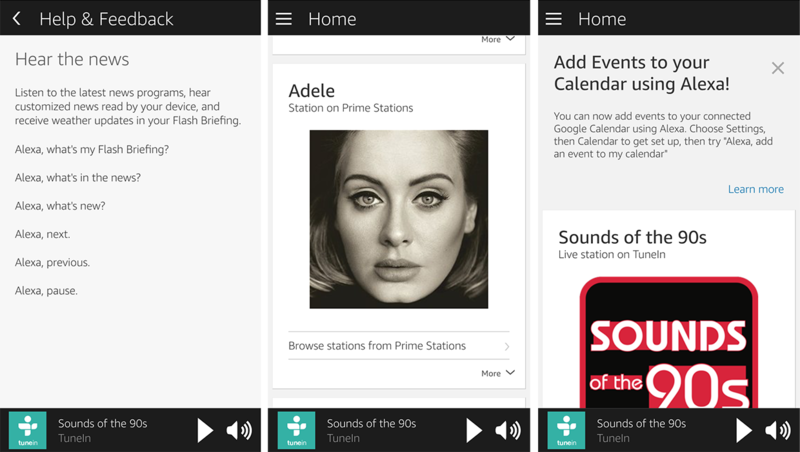 You can access Internet radio stations at the touch of a button on the Triby. The pair on the left side resemble old-fashioned rotary telephones. You can program each of these with a phone number for one-touch VoIP calls. They won't need to remember phone numbers, and you won't need to give them cell phones or pay for a land line. The only caveat is that the people at the other end of the call must have the Triby app on their cell phones in order to receive the calls. That also means you can't program the buttons to call 911. You can make VoIP calls right from the Triby, but only using either of the two preset buttons. The Triby’s front sports a 2.9-inch, always-on E-Ink display. While it’s only black and white, it’s visible in pretty much any lighting condition. I found the display to be consistently clear and legible—even from eight feet away. I will say, however, that most people will find the size of the display, as well as the size of its text, too small for anything but up-close viewing. The display has a crude Etch A Sketch look to its text and graphics, too. You can program most of the display's features using the Triby smartphone app. Having it display nothing is an option, too. The Triby’s screen does an excellent job of remaining legible even in direct glare. The Triby’s companion mobile app bundles a variety of services; namely, messaging, VoIP calling, and radio stations—under one umbrella. 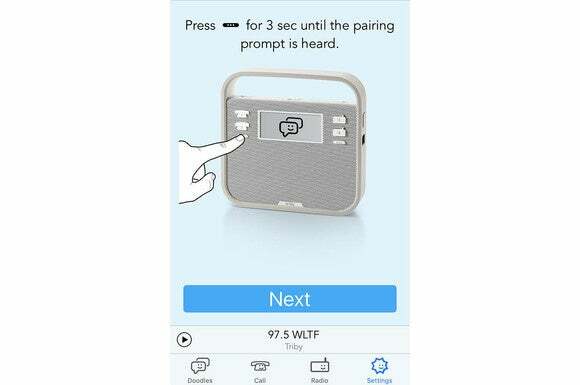 The messaging app allows you to doodle notes or send emoticons to the Triby; VoIP calling allows you to call the Triby or other people with the app; and the radio section allows you to play and organize a host of Internet radio stations. The app and it’s related services all work as advertised, but you can only exchange messages with other people who have the app installed. I don’t know about you, but I’m at the stage of app overload, and so are many of my friends and family that I might want to exchange messages with. I really don’t need yet another messaging service. The Triby has a unique messaging feature: A yellow flag pops out of the left side when a new message arrives. While these features might be fun for little kids, I think they’ll drive parents nuts. You can type or draw messages on the app and send them to the Triby. When a message arrives, a little yellow letter flag will pop out of the Triby’s left side. Message senders will know when their messages have been seen when someone taps the yellow letter flag. That’s cute, but it’s not practical in the long run. Having no keyboard, replies from the Triby are limited to emojis. Would a household couple ever downgrade their communication habits that way? I tried—I really did—to use this feature, but its novelty wore off after three or four days. 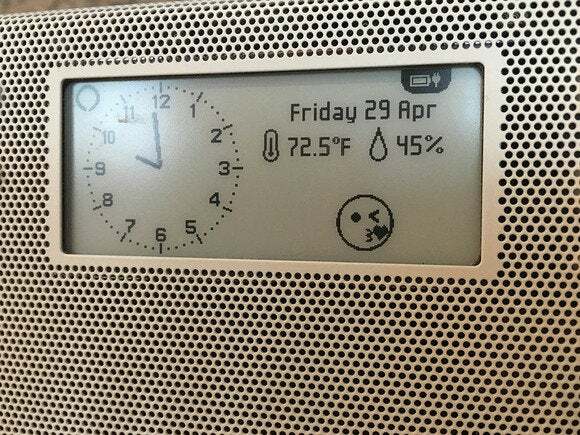 Sans Alexa, the Triby is a nice toy, but it’s pretty useless for real-world communications. Had I reviewed the Triby when I received it in December 2015, my reaction would have been “meh.” I would have said it’s just another wireless speaker (albeit with Spotify Connect integration), and that it has some cute features that youngsters might like. I never found it useful or practical for everyday use. Now that the Triby comes with Alexa, I have a completely different opinion. The difference is like night and day. The little toy has grown up to become a high-powered digital assistant. 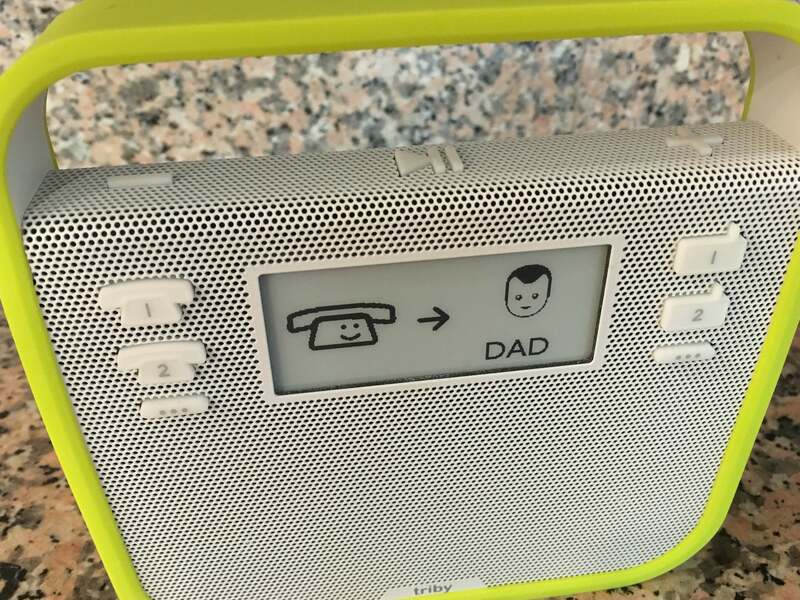 It’s everything Amazon’s Echo is, but with the useful additions of a display, a speakerphone for VoIP calls, and a fun-for-kids messaging service. I like it a lot.